Usually an hour seems like an insignificant amount of time but considering the global epidemic of our sleep deprived society, even this minimal loss causes many important problems. There are serious health repercussions of this forcible shift in the body clock. Springing forward is usually harder that falling backward. Why is this so? People’s natural internal body clock and daily rhythms are slightly longer than 24 hours and every day, so we have a tendency to delay our sleep schedules. Thus, “springing forward” is going against that natural rhythm. It is like a mild case of jet lag caused by traveling east when we lose time and have a hard time falling asleep at an earlier hour. We co-lead a sleep evaluation center at the University of Pittsburgh Medical Center, Childrens’ Hospital of Pittsburgh and take care of patients with different kinds of sleep disorders. We regularly see patients who are dealing with the effects of sleep loss. We fully understand what’s going on with them because of our in-depth understanding of how the sleep-wake processes work. Me this morning: Ok, it's still too cold, but at least the sun is up early and I'm not going to work in the dark. Then I learned it's daylight savings on Sunday. Soooo, it's back to dark and cold mornings. cool. cool. Many studies have now demonstrated that there is an increased risk of heart attacks, stroke and high blood pressure associated with sleep deprivation. Workplace injuries increase and so do automobile accidents. Adolescents, of course, find it harder to wake up in time to get to school. Is there something we can do to deal with this loss of sleep and change of body clock timing? Of course. The first step to dealing with this is increasing awareness and using the power of knowledge to combat this issue. Here are some quick tips to prepare yourself for the upcoming weekend. Do not start with a “sleep debt.” Ensure that you and your child get adequate sleep on a regular basis in the weeks leading up to the time change each year. 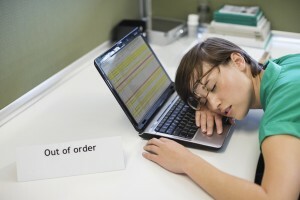 Most adults need anywhere from seven to nine hours of sleep daily to perform adequately. Children have varying requirements for sleep depending on their age. Prepare for the time change. Start going to bed or putting your kids to bed 15 to 20 minutes earlier each night in the week preceding the time change. Also, move your wake timing during the week as this will help you fall asleep earlier. Aim for waking up an hour earlier on the Saturday before the time change. Use light to your advantage. Light is the strongest cue that helps adjusts our internal body clock. When possible, expose yourself to bright light early in the morning upon awakening. If you live somewhere where natural light may be limited in the morning after clocks change, use artificial bright lights to signal to your body clock to wake up earlier. As the season progresses, this will be less of an issue as the sun rises earlier in the day. Conversely, at night, minimize exposure to bright light, especially the blue light emitting from screens of electronic media. Turn off electronics even earlier than the usual recommended duration of one to two hours before bedtime. In some places, it might be helpful to have room-darkening curtains in the bedroom depending on how much sunlight that room gets at bedtime. Carefully plan your day and evening activities. Start planning your day the night before the time change with a good night’s sleep. Incorporate exercise in the morning and leave relaxing activities for the evening. This may help you to wind down. Take a walk even if it is just around the house or your office. Set an alarm for an earlier bedtime and earlier electronics turn-off time. Start with a protein-heavy breakfast, as sleep deprivation can increase appetite and craving for high-carbohydrate foods and sugars. Stop using caffeine after noon. Adults, decline that wine at bedtime. Try to be patient with your kids as they adjust to the new times. We all know that sleep deprivation impacts the entire family. Children are just as confused about this change as adults. Some kids have a harder time adjusting than others. You may notice more frequent meltdowns, irritability, loss of attention and focus. Set aside more quiet electronic-media-free time in the evening or maybe a 20-minute nap in the early afternoon while they deal with this change. Use electronics judiciously. Television, smartphones, tablets and video games are some of the perils of the world we live in. While there are benefits of this technology, especially in helping people stay connected, it can be disruptive at bedtime and in the bedroom. The blue light emitted from these devices signals our internal clock to wake up later the next day and shifts our body rhythm. It is a modern-day challenge that we have to constantly deal with preserving our natural sleep wake rhythm and our health. As the National Sleep Foundation celebrates its annual Sleep Awareness Week March 10 to 16, let’s pledge to uphold its theme to “Begin with Sleep” when planning for our day. A good night’s sleep is the recipe for a productive and fulfilling day. Deepa Burman is a co-director at the Pediatric Sleep Evaluation Center and Associate professor of pediatrics, University of Pittsburgh. Hiren Muzumdar is also a co-director at the Pediatric Sleep Evaluation Center, University of Pittsburgh. This article was originally published on The Conversation. Read the original article. Left: Photo by Robert Daly/Getty Images.